How could anyone resist going to Fring, given the opportunity? The Oxford Dictionary of Placenames tells us that it is probably named from being the homestead of a group of followers of a man called Frea, but the bell-like tone of that short vowel between the two digraphs has a charm that mere explanations cannot add to. And then there is the setting in those rolling hills and tiny lanes of north-west Norfolk. And this is a tiny village, and a pretty one with attractive carstone cottages. 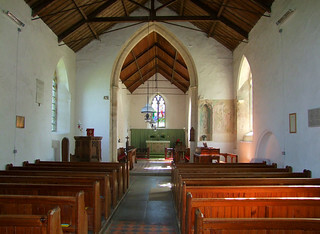 The church is above the street and is proud to be open every day, as the sign outside assures us. 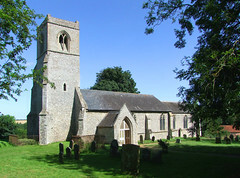 The church appears to have been built all in one go in the early 14th Century, and sprawls in its churchyard like a great lazy lion, Perpendicular Gothic not yet having been along to wake it up and make it stand to attention. 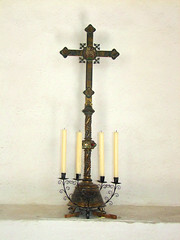 As Pevsner points out, there was an 1890s restoration, but it only cost £350. That's about £70,000 in today's money, which sounds a lot, but you really don't get much for £70,000. Seeing that the east window was renewed, the roof was replaced and all the benches are new, that is probably all they did. 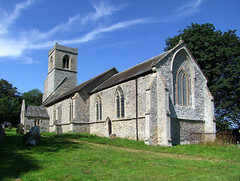 All Saints is a wide, aisleless church, perhaps not typical of this part of Norfolk. It was full of light on the August day I visited, and you are immediately struck on entering by the huge wall painting of St Christopher opposite the south door - again, common enough in East Anglia, but unusual around here. In the Middle Ages, prayers were asked of St Christopher to intercede so that no sudden death might occur to the petitioner that day, a particularly urgent request in the years after the Black Death when the Catholic sacrament of the Last Rites had achieved a new importance. 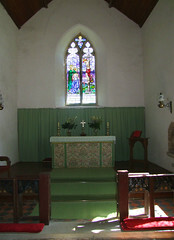 The image was often painted opposite the entrance so that locals could stand in the doorway and make their petition before going about their daily business. I know old East Anglians who still do this. 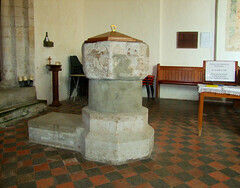 The font is slightly earlier than the church, one of those Purbeck marble fonts so common in this part of the world, although this one is set on a great cement drum as if to make it appear part of the world-famous series of Norman fonts in this part of Norfolk. 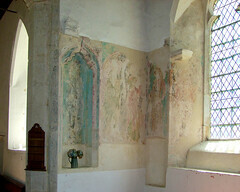 There are more wall paintings up in the south-east corner of the nave, part of a sequence of figures which may be Saints or even a Marian sequence. Beside them is an elegant image niche, intriguingly painted with another figure at the back. 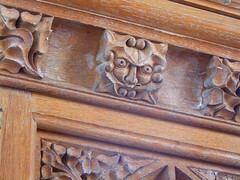 There's a green man on the pulpit, who looks as if his radar eyes might be scanning for anyone not listening carefully. 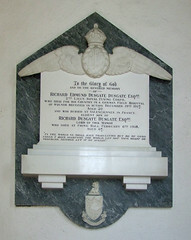 Up in the chancel, a wall memorial features a large badge of the Royal Flying Corps, precursor to the RAF. This is most unusual, I don't think I've ever seen one like it before. It remembers Richard Edmund Dusgate Dusgate who died for his county in a German Field Hospital of wounds received in action, December 19th 1917. This real life Lord Flashheart was the son of the Lord of the Manor, and just twenty years old. To the east, a 1984 window remembers that the Coe family had been farming at Fring for a hundred years. 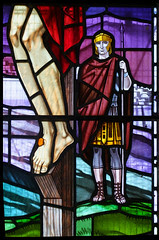 A Maille & Son depiction of the collective mourners at the Crucifixion, it really isn't very good, and is typical of the loss of nerve of that decade. 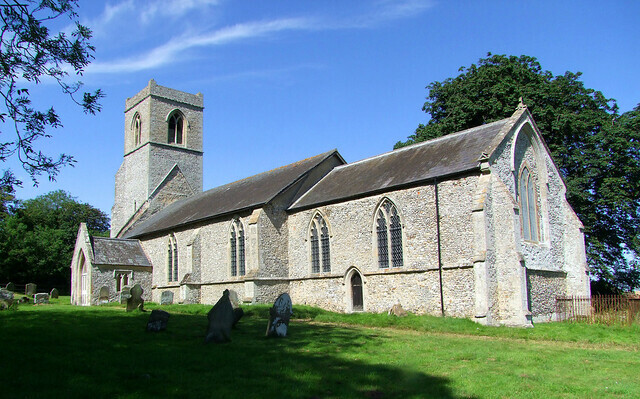 But it is unusual, and if I have made it sound as if Fring church is, in general, a place which is a little out of the ordinary, then that would be right I think.